How does your church’s pipe organ look? It’s only natural that pipes gather dust over time, but it’s important to keep them as clean as possible over time to prevent any sound distortion as you play. As dust accumulates, it can get in the way of the sound waves vibrating the surfaces they are supposed to. As a general note, you shouldn’t need to clean your pipe organ except for once every ten years or so, but quite a bit of dust can collect during this time. You may even notice a change in the sound once the organ is cleaned! Did you know that pipes made from alloys of tin and lead are delicate? They can be dented with the slightest of bumps. And, you could even change their shape by gripping them too tightly. Make sure that, if you are presented an opportunity to hold one, to do so carefully and with an understanding of how fragile they are. How old is the pipe organ in your church? Organs that date from the 1700s usually have had an oxide layer form on the surface of the pipes. This makes them a little stiffer, and it usually will alter the color to make it darker. However, if you polish them, you may lose their historic sound. It is in your best interest to leave them as they are to age gracefully. Also, simply touching these aged pipes with your bare hands can leave fingerprints behind and make them more susceptible to rust, so be cautious and leave them alone. Some workshops can finish pipes with a clear varnish to help prevent rust in the future. All organs are different, but no matter what repairs are needed, you will need to replace anything that is broken with a new part. Parts are typically made on-site to avoid any issues with further installation. While all organs are different, and it might take some finagling, you can be sure that our team can find out what is wrong and replace the broken part with a new one. Remember that repairs are like a puzzle. Pipe organs will require repair and maintenance over time, and occasionally, that means a total overhaul of their parts. However, this can take about 15 to 20 years from their construction. Sadly, this means that many of the people who build and repair organs will have retired in that amount of time. That’s why companies like Whitesel Church Organs are family-owned. We pass down our knowledge from generation to generation to ensure that you are getting the best service. 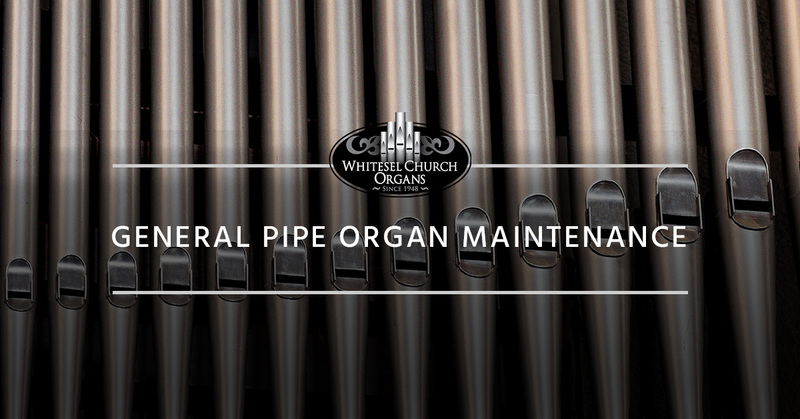 If you are in need of a new church organ, need your current pipe organ cleaned, or would like some repair work done, please give our team a call! We look forward to helping your organ get back into the best shape of its life. Our family is here to help your community grow stronger together with music!